A team from Copenhagenize Design Company recently returned from Bangkok where we had the pleasure of working on an exciting project. It is fantastic to be surprised. 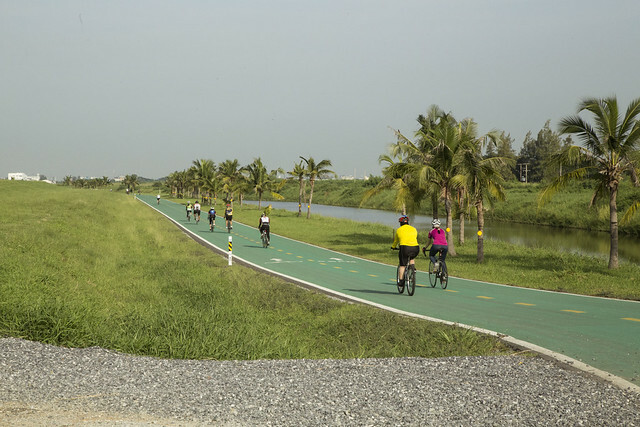 Thailand's second largest bank, Siam Commercial Bank (SCB), have constructed a 23.5 km long cycle track around Bangkok International Airport - Suvarnabhumi. The beginning of one of the most impressive CSR projects we've ever seen and we are excited to be a part of it. It's not every day projects on this scale see the light of day and we had a fantastic site visit with our partners from SCB, King Power and Superjeew Event. Copenhagenize Design Company have been hired to take the basic idea and simply make it World-Class. It's a brilliant combination of placemaking, infrastructure, planning and communication for a destination for cyclists and Citizen Cyclists alike. Basically developing what could be one of the most interesting bicycle destinations in the world. 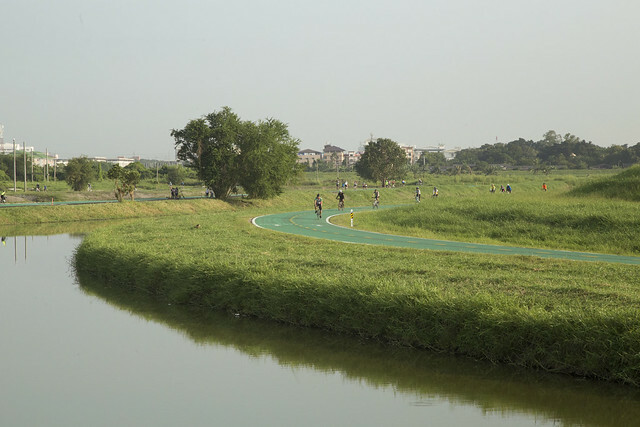 copenhagenize@suvarnabhumi bike track from Viwat Wongphattarathiti on Vimeo. 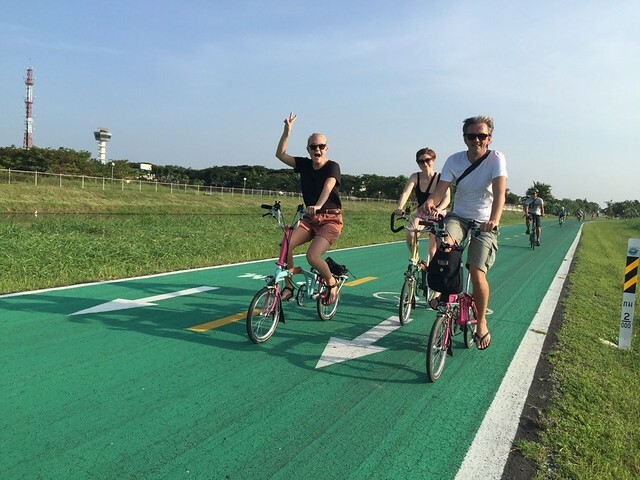 Bascially, SCB, together with Airports of Thailand (AOT) who own the land, took an access road along the perimeter of the airport and resurfaced it in a bright, green colour - 4 m wide - to create a one-way cycle track for recreational/sport cycling. The road is inside the airport's moat designed for flood protection and outside of the fence leading to the runways and airport's operational area. For obvious security reasons, there is only one access point and the cycle track is one-way along the entire 23.5 km length. Mie, Anina and Mikael from Copenhagenize Design Company on the site-visit. At the moment, the airport cycle track is in a basic form. The cycle track loops around the airport but there are no facilities. It is open from 06:00-18:00 each day. On the Sunday morning that we visited for our site visit, we arrived at 07:30. The security team at the entrance informed us that 6000 people had already entered the track. Six thousand! An astonishing number. On average, there are 3000 people a day on a weekday using it - primarily in the morning and afternoon before and after work but also because the temperature is cooler. Riding along the 23.5 km length, we never really felt that it was crowded with 6000 cyclists. They all spread out nicely along the track, what with differing speeds. 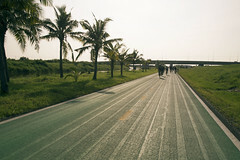 There was a great variety of cyclists on the track. The vast majority were kitted out in cyclist clothes and riding racing bikes in a wide spectrum of skill levels. There were groups of riders muscling past at speed and there were couples, friends and individuals enjoying some exercise. There were a few kids out on the track, too. Copenhagenize rocked the track on three Bromptons provided by our hosts. 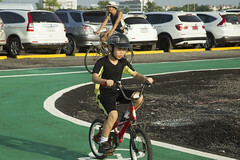 At the start area, a short 1 km track has been added so that kids - or less-experienced cyclists - can go for a spin as well. At this stage, Copenhagenize Design Company is in the midst of the consultation process so we'll have to wait with writing about our catalogue of ideas for how to take this fantastic facility and make it truly world-class. Until then we are amazed that it even exists. 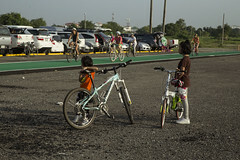 Bangkok is not exactly known for being a bicycle-friendly city. While Copenhagenize Design Company primarily works with cities on transport infrastructure, this project is too amazing to resist for us. We are convinced that making it into a world-class destination will have a powerful knock-on effect for improving conditions for cyclists in the city itself, where bicycle advocates are fighting an inspired fight. Like getting this separated bicycle facility put into place on one street in Bangkok. The airport cycle track may be a roundabout way of doing it, but the local advocates are doing great work so it will all go hand in hand. The Prime Minister of Thailand helped us all out by announcing, on the day before we arrived in Thailand, that he wants Thai cities to focus on bicycles as transport in Thai cities. So thanks, Mr Prayuth Chan-ocha, for that.